Quickly and easily use our voice broadcasting service to send out automated phone calls to a list of phone numbers in seconds. Try it out completely free today and see why so many organizations rely on DialMyCalls as their automated calling system! Over 80,000+ Organizations Rely On Us To Deliver Millions Of Voice And SMS Messages! During voice broadcasts our AccurateAMD™ answering machine detection system helps determine whether or not the call was picked up by a live person or an answering machine (voicemail). Customers are able to verify a phone number on their account that can be used as their custom caller id that is displayed when broadcasts are sent out to their contacts - vanity phone numbers are available for purchase. 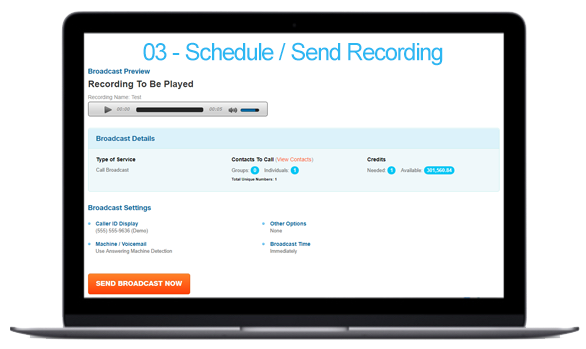 Customers now have the ability to select multiple recordings for a single broadcast. Choose one that will play during a live answer and a play back a different recording when an answering machine is detected. 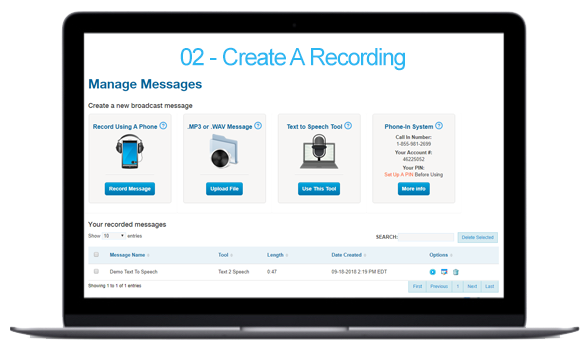 A great message is key when utilizing DialMyCalls' voice broadcasting service - record messages that engage your recipients to ensure that they listen to your entire recording. Our Push To Leave A Message feature allows customers to give their call recipients the option to leave a message which is available for playback in their broadcast report. Adding this feature to your call is completely free and will give your recipients the ability to push a key on their phone to opt out of any future calls from you. Adding the push to repeat feature to your voice broadcast will give your recipients the option to listen to the message one additional time. Our press-1 (push-to-talk) phone call campaigns give all call recipients the option of connecting to a live representative from your organization. Create personalized telephone polls with questions that your voice broadcast recipients can answer right through their phone. Create and send on-demand, high quality text-to-speech recordings using a male of female voice in either English or Spanish with our voice broadcasting platform. Utilizing DialMyCalls requires a verified phone number to send out voice broadcasts - use your own number, a business line or purchase a local vanity phone number. See All Features We Offer! How Does Voice Broadcasting Work? Add your phone numbers or quickly import a list in Excel or CSV formats. 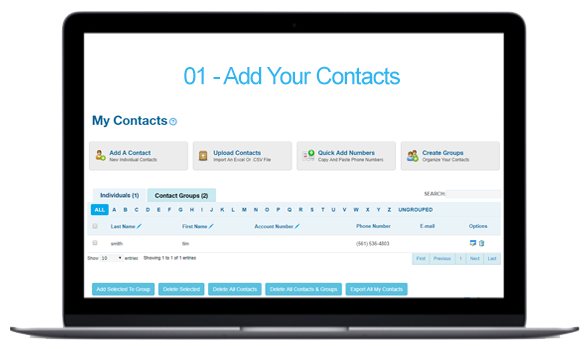 Use our groups features to easily organize your contacts. You can easily record your voice mail message using any touch tone phone or our mobile app. You may also upload a WAV or MP3 file to use as your message to be sent. Send your voice broadcast out right now or schedule for a specific day and time. Once it's sent you'll get a detailed report showing what happened on every phone call! Find the right plan for your organization, or test it out for free. Our monthly plans are our best value and perfect for people who call or text the same group of phone numbers each month. No Contract! Upgrade, downgrade or cancel the plan at any time. Send calls, text messages, and/or emails. Calls can be up to 2 minutes in length and all premium call options, except push-to-talk are included. Who Uses Credit Packages: The more you buy the more you save! Our credit packages are popular with people who only send broadcasts on occasion or if the phone numbers they call change frequently. No monthly fees - simply buy credits and use them as needed. Credits can be used for calls or texts; e-mail included for free. 1 Credit = 1 30 Second Call to 1 Number or 1 Text Message. Let us create the perfectly pricing option to suit your needs. We can create annual plans to make budgeting easier and we also offer bulk pricing on our pay-as-you-go credit packages. Perfect for customers who needs plans based on per member or unit pricing. Annual plans for organizations who need to make budgeting easier. Pricing that will span across multiple accounts for your organization. Bulk pricing for larger organizations that use a higher volume of credits. DialMyCalls offers a school notification system that bridges the communication gap between teachers, students, and parents. How to notify students, parents, teachers, staff and anyone else your school needs to reach using our emergency text messaging notifications system. In times of bad weather or other emergencies, make sure you notify parents in advance that school will be closed with our voice and text messaging service. Our phone tree software eliminates the hassle of a traditional calling tree and allows you to send automated church calls to everyone in your congregation in seconds. We've found an increasing number of customers setting up their account with a prayer hotline. Create your own unique phone number that lets people call in and request prayers. Reminding your church of special masses and events has never been easier using a church phone notification system. Works great for both small churches and large mega-churches. Register your own local or toll-free number to set up as an emergency hotline - keep it updated with the latest information, allowing people to call in for news and information. Setting up emergency alerts by phone has never been easier. Now you can easily allow people to opt-in to receive your alerts right from your own web-based control panel. See why countless social clubs like Knight Of Columbus, Elks, Rotary, and so many more are using DialMyCalls to send phone calls and text message to their members. Easily send phone calls or texts to all your volunteers to alert them of volunteer opportunities automatically and get immediate feedback. Send automated overdue / late book reminders by phone call or text message. See why so many libraries use DialMyCalls to send their overdue reminders. Make collecting rent easier than ever before. See why so many property managers are turning to SMS and phone calls for friendly late rent reminders. Every emergency plan for property managers needs a mass communication system in place - keeping residents aware of all emergencies. Using our vanity number system, you can get your own unique phone number that can be used to allow residents to call in and leave complaints and suggestions. Daily motivational quotes sent directly to your employees via phone call or SMS text message are a perfect way to get a little pep in everyone's step. For any business, communication with your employees is key. Keep them informed via phone call, text message (SMS), and e-mail easier than ever before. Keep job candidates informed of new positions that are available. Many staffing agencies rely on our broadcasting service to keep job seekers in the loop. When you're on the field and need to send a reminder and all you have is your cell phone, our app will let you instantly send a phone call or text alert to your entire team. With the DialMyCalls App you can quickly notify all the parents within a few seconds. Open the app, record or type your message, and hit send! When there is an emergency with your sports team make sure you are able to inform all the parents and necessary people immediately.